This is a beautiful lighthouse just in the area of the Pyrenees- Atlantique near Pointe St. Martin, a rocky projection overlooking the city. It was built during 1830 to 1832 and has been declared a historical monument since 2009. From the top of the lighthouse you will get some of the most breath taking views of the sea, mountains and the city. EUR 2 for 4-16 years. How popular is Phare De Biarritz? People normally club together Galerie 13 Avril and Musee Historique De Biarritz while planning their visit to Phare De Biarritz. The lighthouse is beautiful and worth going. The best is to go by foot and walk there. It got a nice viewing point over the beach of the city. Nice view, nice park, nice place for a moment to take a short break. Not much to do apart from admiring the view. I am not great with heights but climbed the steps slowly and carefully to the top and my gosh was it worth the view. The views are stunning over Biarritz the mountains in the background and the Atlantic ocean across the bay is stunning. Its hight up and you can see for miles on a clear day. I enjoyed the experience and loved the quirkiness of the lighthouse. 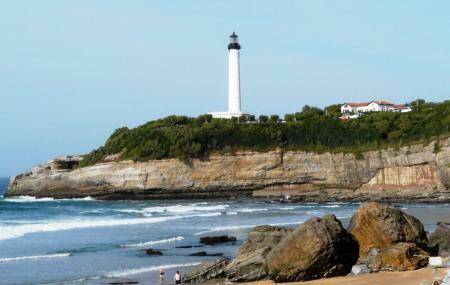 The area around the foot of the light house is good for picnics and looking out over Biarritz. The colours are beautiful and the light is stunning.